A space elevator capable of shuttling robots or humans from the Earth to space remains decades away. But a company headed by a former NASA researcher says it can build a space elevator on the moon using today's technology. The LiftPort Group wants to raise $8,000 on the crowd-funding website Kickstarter for its first step — creating a floating balloon platform tethered to the ground so that a robot can climb 1.2 miles (2 kilometers) into the sky. But the fundraiser also marks the return of a company that had closed during the 2007-2012 economic recession. "About six months ago we had a fundamental breakthrough — a breakthrough we think will transform human civilization — and we want you to be a part of it," said Michael Laine, president of the LiftPort Group. The breakthrough will allow the LiftPort group to build a space elevator on the moon using existing technology and a single-launch rocket solution that has "Sputnik-like simplicity," Laine said. He added that the concept could become a reality within eight years. Laine worked on space elevator concepts with the NASA Institute for Advanced Concepts research team from 2001-2003. He went private with the LiftPort Group in 2003 and experimented with robots that climbed as high as 1 mile (1.6 kilometers) up a tethered balloon platform, before the company shut down. Such balloon platforms don't just help aim for the moon. They could also act as cheap communications "towers" on Earth to help provide wireless Internet, monitor crops, watch out for forest fires, or even carry cameras to provide an eye in the sky in the aftermath of natural disasters. Tethered balloons help test concepts for a space elevator at the Mars Desert Research Station in southern Utah in 2006. The newly resurrected LiftPort Group has set a relatively modest fundraising goal because it's still training a new group of volunteers. Many former LiftPort members have gone on to other projects — Tom Nugent, a former research director for LiftPort Group, co-founded a company called LaserMotive that has experimented with using lasers to power climbing robots and drones. Laine also emphasized his vision of Kickstarter as being more important for gathering a community rather than simply raising money. He pointed out how most people contributing to the top Kickstarter projects contributed relatively little in terms of money, but instead brought their enthusiasm to the projects. Still, modest steps have not prevented the LiftPort Group from planning what to do in case it raises more than the $8,000 in its first Kickstarter project. Its list of "Stretch Goals" pegged at successively higher funding targets include adding more sensors and having the robot climb to almost 19 miles (30 kilometers) up. The most ambitious goal of raising $3 million — a target Laine doesn't expect to hit in the first Kickstarter — would allow the LiftPort Group to carry out a one-year feasibility study for the moon space elevator project. But Laine did express the wish to hit a $100,000 target. "If we 'only' hit $8,001, then we are going to remain a 'hobby' team," Laine said. "If we can hit this number, then LiftPort is a '…before this decade is out…' Lunar Elevator company!" 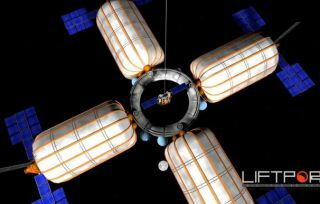 The LiftPort Group is not alone in its long-term space elevator quest. Seattle-based LaserMotive has previously won the Space Elevator Games, a NASA-sponsored contest. Across the Pacific, Japan's Obayashi Corp has set the goal of building a space elevator by 2050.